The film Tsar Ivan the Terrible, which is thrilling viewers throughout Russia, has also generated a lot of interest abroad. Currently, Sweden, England and America have requested to show it. The director has received an invitation from the Danish Nordisk Production Company, where he will shoot films based on Russian historical themes. By the way, the company has also proposed shooting a film about Stenka Razin, Don Quixote and Mephistopheles with Feodor Chaliapin. 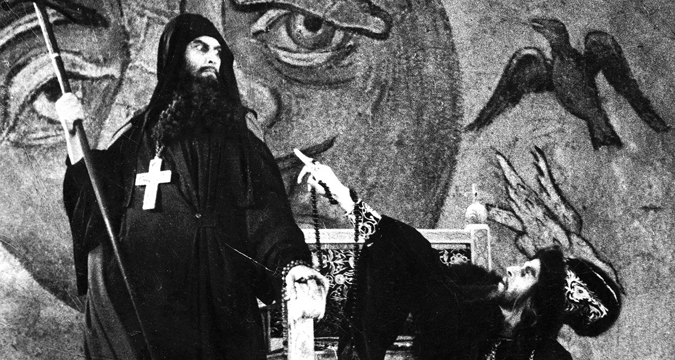 Tsar Ivan the Terrible's triumph has proven that filmmakers who think that Russian historical films are not successful are wrong. A film that has an intriguing plot, good actors and proper taste and budget will not only draw interest to itself in Russia but will also be well received abroad. Yesterday the Handicraft Museum inaugurated an exhibition of products from the School of Toy Craft in Sergiev Posad. The exhibition graphically shows the entire process of toy production, starting from the manufacturing of blanks. The exhibition is very interesting. Everything is done very elegantly. The section with turning toys, with all the chiseled things embracing each other, is particularly good. In the section with various sculpted toys the figure-illustrations with fables are fascinating. The wealthiest and most captivating section is the one with toys made of a special paper mass, an imitation of porcelain. On Monday, December 21 a very animated Christmas bazaar was organized from morning until very late in the evening. All the sellers and stands were doing a brisk trade and our meat sellers were particularly lively, considering the upcoming holidays, the increased prices on meat and on sliced game. The Moscow wine exchange has just one preoccupation: What can be done so that Moscow would start "drinking?" It has devoted lots of energy to obtaining results. It sent out petitions and sent "walkers" to Petrograd. Seeing that it is not getting anywhere, the exchange has decided to make one "last attempt." It has decided to act through… "through Yalta" [Yalta is a popular resort town in Crimea, which in 1915 was part of the Russian Empire – RBTH]. It turned to the Yalta municipal administration. Let Yalta support the Moscow wine exchange's petitions. Let Yalta prove that there is nothing terrible if Moscow and the Moscow Governorate are allowed to sell "pure grape wine." Why the wine exchange thinks that precisely Yalta has competency in this issue remains a secret. God, how I hated those "artificial" spruces, spruces I saw that my friends and relatives had. My uncle's spruce was very severe in style. The tree we always had was so small that to be seen it was put on a stool. However, this small spruce sparkled and was bursting with light. But my uncle's spruce stood high and deep in his gloomy study, standing like some threatening mass, since the light from the many candles around it could not penetrate the darkness of its thick needles. But worst of all were my uncle's gifts. May his soul forgive me but I still cannot recall without repulsion those boxes with his "useful activities." And who ever created those confounded baskets, folding games, articles made of straw, sticks and beads, those idiotic variations of classical lotto? Some evildoer must have invaded the sacred world of my childhood and pervaded it with the rotten smell of some penitentiary.